I’m a very pro-monsters kind of DnD fan. My favorite books of any edition are usually the ones that describe as many monsters as possible in as much detail as possible. In fact, it’s kind of what brought me in to being an active player - Bogleech’s article on how WotC were finally discovering the charm and whimsy that defined TSR monster design is what made me decide that hey, maybe this 5e thing is something worth checking out. And it was. The 5e Monster Manual is my favorite core MM, due in large part to the way the monsters slot together to build a very genuine-feeling world. It’s not perfect - the descriptions of our lovable host of hostile sapient species could have used a little more work, for one - but reading through it is enough to give just about anyone a working understanding of the standard DnD setting, and I think that’s remarkable. Around the time I read it for the first time, I remember having a thought - I didn’t think I wanted another monster book filled with half-baked ideas and unrealized concepts. I wanted something that would really focus in on the world the MM had created, something that would take me out of a bird’s eye view and really show me arround this setting. Like the Draconomicon of previous editions writ large. Volo’s Guide to Monsters is my favorite RPG supplement. I must’ve read through this thing half a dozen times by now, and I want to share the joy it’s brought me with the rest of the board. In my opinion, Volo’s Guide realizes the monsters it contains better than any other book of its kind, be that as true horrors or as people with reasons they act the way they do. It has fascinated me, and I hope that I can help all of you find a little bit of that fascination, too. I’ll be doing my best to update this daily but, you know, college. I won’t pretend I’ll be perfectly punctual. Tomorrow, we start off with the Prefix and opening lines. You know I'm gonna be following this one. Having just picked up Volo’s this weekend, I’m definitely subscribing to this thread! I think Volo's doesn't get nearly enough love. Those first chapters, the deep dives into different types of monsters, are just gold. And the rest of the book is quite useful as well! Overall I think Volo's is a good book. It's not my favorite of the 5e non-adventures, but it's definitely better than the bottom 2 of SCAG and Mordenkainen's... SCAG I will give a pass to as I think they were figuring out the paradigm for the edition. Mordenkainen's has good sections, but just feels kind of "meh" to me. Huh. Recently got hold of this after finding it for cheap in a local shop, but haven't yet had time to read it properly, I think this is a sign to keep an eye on this thread and read along. I'll probably chime in on this too. 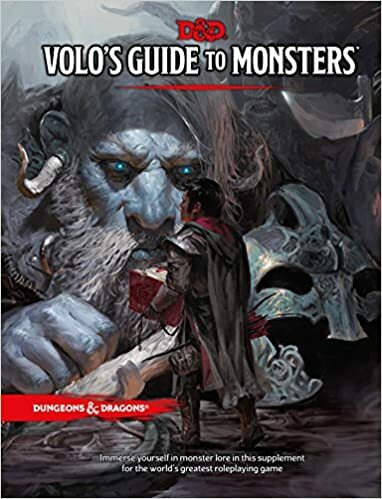 I'm not a huge fan of 5e, especially when it comes to lore, but I don't think that Volo's is all bad - just an exemplar of 5e's status as a mixed bag to me - and I am interested in seeing other's perspectives on the material in it, even if I do have some critiques about it. Dotting. I'm probably not the audience for this book (I am completely tired of designating certain kinds of beings as "enemies"), but I will try this thread out because I encouraged it. I feel like it's less 'biased' than the average D&D Monster Book: it definitely focuses on enemies or at least how specific monsters work as enemies due to that being what many players want, but there's a few 'likely friendlies' mixed in as well as the PC races section in the back (Mostly 'monstrous races') which is very player-facing. Sure, it's a book of statblocks with the assumption that in most cases they'll be used as antagonists, but that is arguably the basic concept for that sub-genre of RPG books. The monsters within do seem to come from all over D&D history, too.